* We also sell a Personalized Version for $5.00 extra. 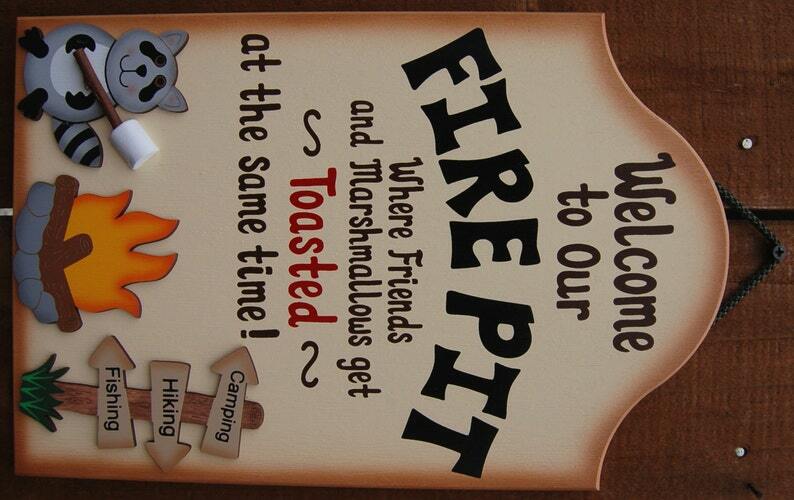 This Firepit sign is our newest and most popular camping sign. Do you and your friends get toasted at the same time as the marshmallows get toasted? If so, your friends and family will get some good laughs from this Firepit sign. Sign is made from wood and hand painted with a cream color exterior paint. Letters are painted black, brown and red. Fire, raccoon and camping arrow signs are all separate piece of wood which is attached to Firepit sign. It is finished with a brown shaded edge around the outside, which creates a unique finish. The handmade camping sign is painted with exterior paint. The handmade and hand painted wood camper signs are done with exterior house paint, they also hold up incredibly well to sun, wind and rain and will not fade for years. You may also enjoy our hand painted and hand crafted seasonal crafts, which also have funny and unique phrases, which are also made with exterior house paint. If you like these hand crafted happy camping signs, or are looking for other camping signs, be sure to also check out our camping and RV page, or Margaritaville, bar signs, lake, pool, tiki, and kids decor, on our website which also make an excellent addition to your camping decor. Handmade happy camper signs are made exclusively by our family at Uniquely Crafted, in Niles, MI. Also see our other camping products on our website to find other personalized items. To bad the rating only goes to 5 because I would rate this with a 10... I love this & the price was perfect. It only took a few days to get too. I am planning on ordering a few more things because a lot of people really liked my sign.. Thank You..